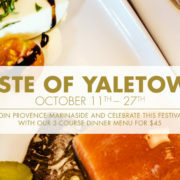 Taste Of Yaletown has come a long way from its humble beginnings 14 years ago when it was a secret whispered about around the neighbourhood. With close to 30 restaurants participating last year (and likely more this year), TOY has become an event looked forward to by diners from all over the Lower Mainland. This year at Provence, our menu features your choice of FROG LEGS PROVENÇAL, or SMOKED FISH CAKE to start. For your entrée, you can choose BOUILLABAISSE, DUABE D’AGNEAU, or SEARED LOIS LAKE STEELHEAD. And of course, no meal is complete without something sweet to finish, so go ahead and make your choice from our dessert menu. See the full menu below. Book your table now, before we’re full.